© 2012 by Madison Parker; all rights reserved; content may not be copied, rewritten, or republished without written permission. In these times of high unemployment and municipal financial situations causing cities to lay off police officers, it is important to consider the case for home security and family protection. Locks are a homes first line of defense. Good locks will deter the average criminal trying to break into your home. But that protection is only as good as the lock—or who else has the key. If you just moved into a new home, lost your house keys, or want to ensure that no one else has the ability to unlock your door without your permission, it is time to replace old locks and improve your homes security. If you want good security on your door, dont depend on your door knob to provide it. But the knob lock is better than nothing. 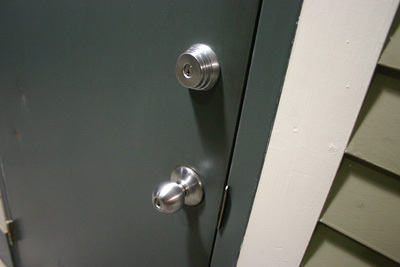 Consider a door knob that can be opened from the inside whether it is locked or unlocked, but needs a key to be opened from the outside. That way you dont ever have to leave home wondering if you remembered to lock the door. One rather simple way to avoid this is to say what you are doing silently to yourself while you do it (turn off, lock up, etc.). Yes, it does sound goofy, but it works! If you already have a deadbolt on your door, it should be easy, right? Just put the new hardware into the holes where the old hardware was. However, according to locksmith C. Amy Palmer, who works with Cappys Keys, Inc., in Florida, you need to make very careful measurements of the old hardware versus the new hardware. Standard deadbolt openings now are 2 1/8". There are still a lot of doors out there with smaller holes which means using a hole saw and knowing how to enlarge that hole without the advantage of a pilot hole to guide the bit or the expense of a jig, she explained. Palmer also doesnt recommend purchasing the most expensive brand carried by the big box stores for a door that is prepped for current standard locks. Assuming we are buying locks using the pin tumbler system, the added expense is not recouped as a greater level of security—go mid-grade, she said. Locks are graded, with Grade 1 being the best. Experts recommend not going any lower than a Grade 2 lock. For a simple lock exchange, where everything fits perfectly into the existing lock holes, you may not need to do anything more than a screwdriver to remove the old lock and install the new one. If the new lock system doesnt match the old lock system, the project gets a little more complicated. You will need a tape measure, a hole saw to increase the size of the hole, a drill if a new latch hole is needed, a chisel to make sure the strike plate and the latch plate are level with the door, and a screwdriver. The lock packaging will include a template to help with proper measurements. If you dont want to have to carry around a pocketful of keys, consider a lockset combo package comprised of a door knob and deadbolt. If you want a single key that will open every lock on your house, a locksmith can re-key the locks for you. Palmer said you can put the strongest, non-drillable, non-pickable lock on your door, but if there is an accessible window anywhere in the structure, all of that metal is meaningless. Locks need to be integrated into security systems with a glass break detector to really be effective. If that isnt an option, consider a deadbolt that needs a key on both sides rather than a turnkey deadbolt. Madison Parker is a security professional whose passion for helping others led to the creation of HomeSecuritySystems.net. Get more home security tips and advice on her blog here!